2017 has been an absolutely amazing year for the Hustle and Flowchart podcast! We recorded 50 episodes. We interviewed 39 guests. We created 11 solo episodes. And close to 100,000 people have listened to the show. Month over month, the podcast has gotten more downloads than the month prior and we're starting to see more and more people mention our show in discussions about the best business podcasts. …And we're just getting warmed up! 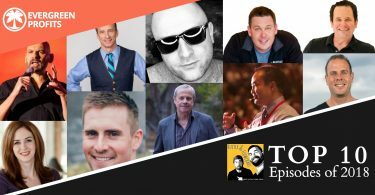 We already have a ton of amazing shows lined up for 2018, including people like Ezra Firestone (multi-millionaire ecommerce pioneer), Dan Brock (YouTube super affiliate), Tim Paige (ConversionCast host and webinar master), Josh Bartlett (Founder of Thrivecart and EasyVideoSuite), Syed Balkhi (Founder of Optin Monster), and many many more. So, if you're not subscribed yet, subscribe on iTunes, Stitcher, or Overcast to ensure you get the notifications when new episodes go live! As 2017 comes to and end, I figured it would be a good opportunity to share more insights about the show as well as give new listeners a good starting point. In this post, I'm going to share the top 10 most downloaded episodes, Joe's top 3 favorite episodes, my top 3 favorite episodes, and the 10 most recommended books from the show. In this episode, Jon breaks down the elements that go into creating the perfect webinar. It's not surprise that this one found its way into the top 10 because webinars have been a super popular and very effective way to promote your product. Jon is articulate and a great teacher on the topic and his insights make him the 10th most downloaded episode of 1017. Everyone loves a good “side hustle” and Damien has built a fun one. He finds things like shoes, drones, and the latest hot tech. gadgets and flips them for profit. In this episode, he didn't hold back. 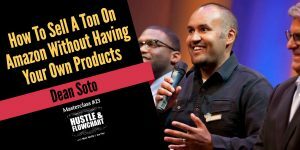 He shared the tools he uses, what he flips, how he finds buyers, and everything in between. His willingness to hold nothing back made this episode the 9th most downloaded episode of the year. This is the only “duet” episode to make the top 10 this year. 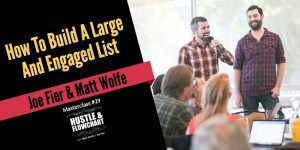 In this session, Joe and I break down all the various ways that we use to grow our lists. We don't just talk about mailing lists either… We discuss how we built our chatbot list, our Facebook group, and, of course, our mailing list, including all the tools and resources that we've used along the way. Bitcoin and cryptocurrency has been an insanely hot topic lately. We couldn't just sit back and ideally let everyone else talk about it and not get in on the fun ourselves. 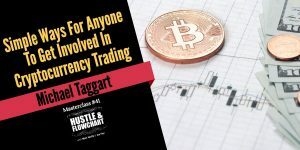 This is actually the second session that we did with cryptocurrency expert, Michael Taggart. 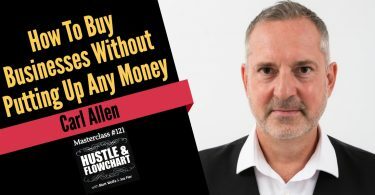 We actually recommend that you listen to this one AFTER listening to the first session we did with him because this one focuses more on how to get invested in cryptocurrency. The fact that this topic is so hot (and controversial) has landed this episode (and Michael's other episode) nicely in the top 10. People have described this one episode as a full online course in selling on Amazon. Dean literally breaks down the entire business model of finding products at wholesale prices and then reselling them on Amazon. He further goes into how to actually outsource and automate a lot of the processes. It's no surprise that this is one of our most popular episodes of all time! 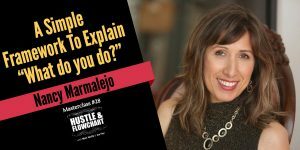 As entrepreneurs who like to dabble in a little bit of everything, one of the toughest questions to answer is “so… what do you do?” Personally, I give a different answer every single time someone asks this because I'm involved in so much. Luckily, Nancy came to the rescue and broke down a simple process that anyone could follow to ensure they give a great answer to this question. AJ Roberts is a marketing veteran and master copywriter. 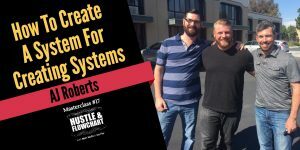 Since a big focus on this show is on creating systems in your business, AJ brought a system to the table for creating systems. Don't know how to systematize things? Follow AJ's system for creating systems and systems you shall have. AJ's massive following and ability to simplify topics makes this episode our 4th most downloaded episode in 2017. Gonzalo was one of the most popular podcast episodes that I ever did over on the Authority Insider Podcast. Of course we had to have him back when we decided to create a podcast around creating systems. 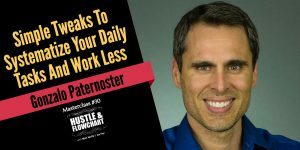 His brand is literally called “Man of Systems.” In this go around, Gonzalo breaks down how he systematizes his day-to-day life to achieve the most results from his workday. Like I said earlier, Bitcoin and cryptocurrency is a hot topic right now. Because it's so hot, we brought in the guy who introduced Joe and I to the concepts of crpytos back in 2010. 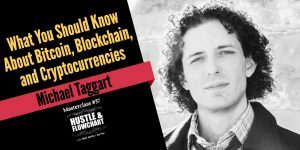 There's no one that we know that is more knowledgable on the topic or is more “in the trenches” with blockchain tech. than Michael Taggart. In this episode, we discuss the pros and cons of the technology, breakdown exactly what it is, debate the future implications, and give detailed breakdowns of exactly what everyone should know about this emerging technology. The popularity of cryptocurrency has rocketed this episode to the number two most downloaded episode ever. And the number one spot goes to non other than one of our future partners in crime, Aaron Fletcher. Aaron has all but backed himself out of his business completely using his simple 3-step framework. Using this framework, you're either going to get rid of, automate, or outsource tasks that happen in your business and in your everyday life. Aaron has perfected this model and broken down into simple to understand terms, skyrocketing this episode to number one. I feel like I think and work similar to Brad, so this episode REALLY connected with me. Brad’s business and his thinking purely revolves around expanding his network. This is where he gets income in the form of partnerships, acquiring businesses, and consulting. 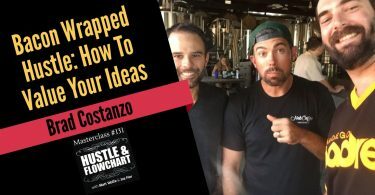 The deal-making that is discussed in this episode is top-notch and will give anyone ideas for using these strategies in a beginner or advanced way. The cherry on top for this episode is that Brad’s key way for expanding his network is to host a podcast. We’ve seen similar results and it’s the BEST networking tool. 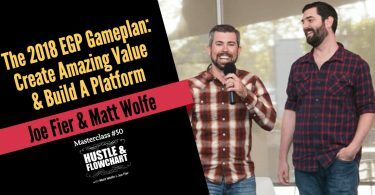 This episode is great for anyone looking to grow their network, build a larger platform, and learn unique deal-making strategies. Gonzalo is amazing and the story he tells in this episode should impact everyone. 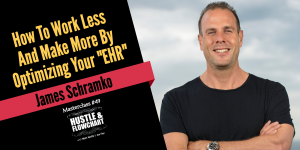 This is a must listen for anyone who is expanding their business but feeling stretched thin. 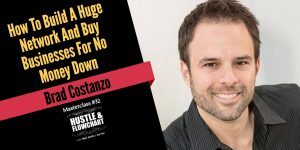 Gonzalo will show you how to effectively outsource to grow smartly and how to use your time in the best possible way (for the highest value to you and your business). 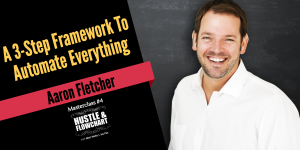 This episode is amazing for anyone who is looking to learn about building effective and simple systems for their day-to-day work, how to become extremely deliberate with your time, to leverage your skills best, and to learn deal-making. Even though this is one of our most recent episodes, it was one of my favorites. The main reason James’ episode resonated is because he seems to have a similar vision for his business and lifestyle as we do. He is extremely deliberate with how he spends his time working, having fun, spending time with family, sleeping and more. He’s also very aligned with the model of Evergreen Profits, which is to build out your platform and to provide value on the extremes (lots of free content and selling high-ticket experiences and consulting). 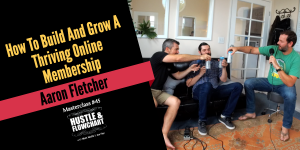 This episode is key for anyone looking to increase their hourly worth, how to design your lifestyle, how to build out a platform, and how to use affiliate marketing and events to expand your income and happiness. I picked this one for my top 3 because of how much info and golden nuggets Aaron gave out. At the time of recording, we were running our monthly Evergreen Profits Letter and looking for new ways to get new members on board. 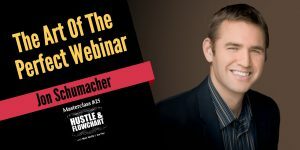 Aaron broke down his strategies for using Facebook ads to bring in new members, how he retains members, how frameworks have changed everything in his business, and just flat out unloaded every detail about his business. It was also one of the most fun episodes we recorded because we did it in person, with beers (which definitely helped pull some secrets out of Aaron). James' podcast made my top 3 because I was so inspired by the lifestyle that he created. He literally built his life and his daily tasks and habits around surfing. He has a simple formula that he uses as his KPI to know what is the best use of his time. He's managed to optimize everything around his effective hourly rate so that that the less he works, the more he actually makes. So many people promise to teach you to work less and make more. James actually gives you a formula, frameworks, and action steps to make it happen. Joe and I strive to build our business around many of the concepts that James teaches. I loved Brad's episode with us because Brad is probably the business that we relate the most to. 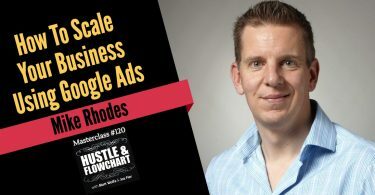 He's got his hands in many pies, from affiliate marketing to buying and selling business, from consulting to podcasting. There are so many things and philosophies that Brad has for himself and his business that resonated with us. Brad shifted our paradigm about what it takes to buy and sell businesses. 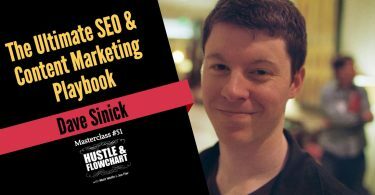 He also gave us new perspectives on the podcast, content marketing, consulting, and much more. 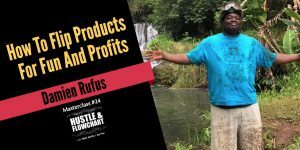 Of every episode that we've ever recorded, this is the one that created the most shifts in the EGP business model. And there you have it… That's a pretty decent sampling of the podcast in 2017. We plan to go even bigger with it in 2018! 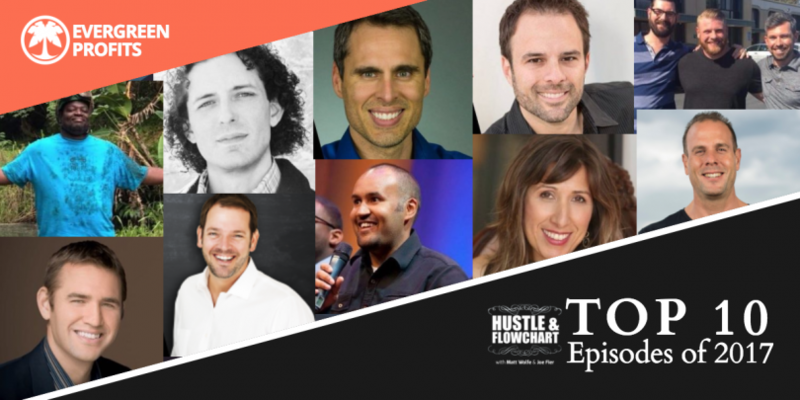 More episodes, more amazing guests, more step-by-step systems, and more free education. If you enjoyed our podcast in 2017, you will be blown away with it in 2018. I do have one final “ask” of you… If any of our episodes have helped you out or entertained you or gave you some sort of “aha” moment, please help us with the big three things that will help this show grow. 1. Share it with your friends or family who are into these types of topics. 2. Subscribe on iTunes or in your favorite player (or search on iTunes for “Hustle and Flowchart”). 3. Leave us a positive review in iTunes. Those three things are what grow the podcast and we couldn't be where we are today without listeners like you. We don't ask for much but we'd love it if you could help us out to get more ears on this show. Thanks so much and let's all have an amazing 2018!